There are oxygen bars and hookah bars and now, an inhalable tea bar, because coming together and breathing deeply with other people is fun. 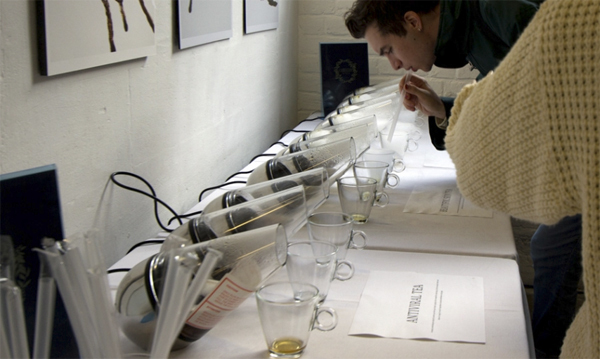 Camellia's Tea House in London recently debuted a "Breathable Tea Room" installation which allowed guests to sample some of the shop's "award-winning" teas in vapor form, from green mint to earl grey to oolong. Images from NOTCOT reveal the tea was served in beakers and visitors inhaled their tea through straws. Funnily enough, a brief promotional video shows the vape tea in action, complete with coughing sounds in the background, presumably because hot gas isn't nearly as sore throat-soothing as hot liquid. Go figure.